On my profile I have mentioned studying and working with Chief Two Trees and others have asked me for more information about this man. 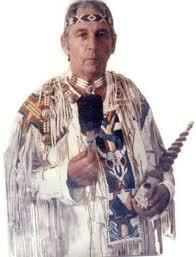 Kenneth Ray Cannon aka Chief Two Trees was born September 19, 1927 in Wynnewood, Oklahoma and passed on April 23, 1995 in Old Fort, North Carolina. Prior to focusing on his Cherokee and Sioux heritage, Chief Two Trees served in the United States Air Force. The chief was initiated later as a medicine man, Cherokee, of the Bear Clan. I met Chief Two Trees in the early 1990's in Old Fort, North Carolina where he had established Native American Studies Institute. Prior to living and working at the Institute, Chief Two Trees would diagnose his visitors from his porch simply by watching them and observing. He was able to tell people what was wrong with them without prior knowledge. The insight he gained allowed him to then prescribe certain herbal supplements, including mineral supplements, along with diet, exercise and other holistic treatments for that person. It was an honor for me to work and live at the Institute for approximately two years. I learned much and met some very interesting people who traveled from all corners of the world for Chief Two Tree's advice, knowledge and guidance. One thing that influenced me to not ask for pay for what I do now in the field of healing and spiritual advice is the practice that Chief Two Trees incorporated within his work with people. The chief had a one gallon glass jar, with a lid sitting next to his chair marked "donations." Those visiting would donate what they could or would not donate if they lacked the funds. The attention gave to the individual was no more or no less based on the ability or inability to give a donation. This donation jar was what I call a spiritual, magickal jar. The reason I say this is that there were several times funds were needed for the van breaking down, or on one occasion the power going out and food was lost in the freezers. A trip to the jar would provide, almost to the dollar, the needed amount of money. Not that it instantly appeared out of thin air, but those who had donated, had donated enough to cover the immediate unforeseen event. Most of the time, as mentioned above, the chief would prescribe herbal and mineral supplements on a pad and hand to the visitor so they would know what to purchase. A little unknown fact, that really stood out to me, was that Chief Two Trees had a stocked room full of herbs that he would buy from donations, and these were provided, at no cost to those who could not afford to buy what was prescribed. Chief Two Trees, myself and others were available 24/7 to "work" on persons who had ailments. We used various treatments including Reiki. Chief Two Trees and several others who worked at the Institute would give "adjustments" aligning the skeletal structure of the body in whole, or just the needed areas. There were times when a person may show up at 3am with a migraine that was overwhelming them and the only relief would be to go the ER and get injected with drugs for the pain, or come out to see us, and have holistic treatment applied. Chief Two Trees was well respected for his knowledge and wisdom that he shared with others openly, keeping an open mind always, and being guided by his love and compassion for all living beings. One piece of his wisdom that has always stuck to me was his response when someone lacked patience and wanted an immediate holistic cure that would rid them of the disease or illness. His response was that it took years for the dis-ease to reach the point that it was at, and it would take, sometimes, an equal amount of time to regress the dis-ease so that it would disappear. Many folks that were trying the holistic approach were used to those immediate masking remedies such as a pill or shot for the pain. Of course these did not heal anything, but did immediately do away with the discomfort and pain. The chief taught balance in regards to ridding the body of disease as well. Whereas Chief Two Trees could and would offer treatments to alleviate pain and discomfort for the short term, he would explain that this was not a healing. His additional guidance was that through the long-term use of herbs and minerals, along with a good diet and exercise of some fashion, would create the balance needed to rid the body of the disharmony or disease. Another piece of advice that Chief Two Trees shared with me that has guided me over the years in the field of holistic healing and spiritual guidance is that you help those who seek and ask....you don't go out looking for them, soliciting them, let them come to you when they are ready. He further would imply that the help we gave, at the institute, was help that helped a person help themselves, not doing it for them. The foremost teachings of Chief Two Trees encompassed homeopathy, home remedies, natural remedies, and of course herbal remedies. There are chapters I could write about Chief Two Trees, what he taught and shared with me, and what all he offered to others. More writings will be for some other time. I will always remember Chief Two Trees for his love, compassion, generosity, caring and giving freely to others. His words and teachings will remain with me always and continue to guide me physically and spiritually. Great to learn how he shaped your life. I'm blessed he's been part of the fabric of my life as well. I'm a vision specialist (unique in its kind) and helped him out with his troubled vision in'92. He gave me the native american name: "Free Spirit". Chief two trees was and still is a source of great inspirations. I hope the forest he lived in is still been taken care of? It is always wonderful to hear from others who had experiences with Chief Two Trees! Thanks so much for sharing. As for the forest there where the institute was located, I am not sure. The property backed up to national forest on at least two sides, so I feel those areas would still be doing well. I have not returned to the area in quite some time. My husband was healed as a child along with his sister by this amazing man. I wish I could have met him. Thank you for posting this remembrance.